It’s pointless to discuss religion with someone who blindly believes it | personal.amy-wong.com - A Blog by Amy Wong. I’ve never been religious… I was as catholic as a 5-year-old could get when their aunts are catholic/christian. Every time we would cross a local church, I would do the cross sign, and I had at least once done the local church tour for Easter week. I have the utmost respect for people and their selected religion. However, it really irks me when religious people go on and put down other religion’s beliefs, which is the worse kind of religion and the preferred type churches want their followers to have. It’s such a pity, because religion can be such a fulfilling experience to some. It makes your life lighter, and sometimes it can get you going. Guys, you can be logical and have faith. It’s like that bit on Peter Pan. I do believe in fairies, I do! I do! It’s a wonderful thing to have, and to feel. However, most of the times you’d find yourself with someone who’s religious, and will tell you things are because they are. The [book of your choice] says so. It says that [such and such] will happen, so it’s going to happen because it’s already begun. 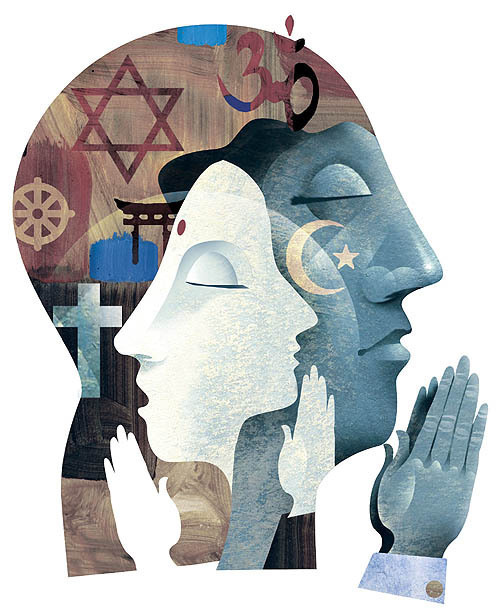 Why can’t more people understand that different religions are like different colors… different shades of colors. Purple has shades of blue and red, depending on how deep your purple is… but in the end, all are colors! Ever since I was little, I’ve always liked variety… different languages, different cultures. 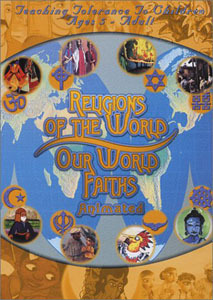 It was great that I got the chance to grow up with this little BBC animated show — shown here back when Discovery Kids wasn’t for babies — Religions of the World: Our World Faiths Animated. Besides the animation bit, I found learning about other religions fascinating! It reminds me of this teacher we used to have in catholic school. I was never into the religion class at school, it was a mission to pass the course with a good grade, but never mind it. However, that teacher came — he told us to call him Grillo… as cricket, Jiminy Cricket — he began telling and testing us about other religions. It was such a refreshing time as a young teen, that quickly ended because he was sacked. Good point of view. I agree. Too many people think they have the one and only way to be and think, and look where it gets us all the time – nowhere but killing and death. Tolerance, sharing and being open-minded can go a long way. By the way – where is the top image from? I really like it. AND, can I still find this little show about different religions? I'm sure i've seen it on YouTube… if it's not only, you can look it up on Amazon… I'm sure libraries should be able to carry it. I'm so glad to live in a country where religion freedom is a MUST. We had to learn all of the worlds religions and when I mean all then I do. Funny thing is though, sure I was born in Peru and had a somewhat catholic upbringing. My family was not religious at all. When we moved to Sweden, that was when my dad somewhat became religious. I was forced to take my first commute although I didn't wanted to. When I later refused to do my confirmation – at the same time as I stated that I didn't believe in god, my aunt still resents me for tat – I came home one day and a priest with 3 nuns were waiting for me to bring me back to the religion. I must say that until this day, the speech I held that day must be one of my most passionate and engaging ever. I made the priest blush and seeing as he could not prove my logic wrong, he just had to go home hahaha. I prefer to be a sheep without a shepherd, thank you very much. She told him that she would attend the talks, if the school paid for my tuition. When time for confirmation came, we were all told that it was a choice. At that time, I had already begun studying design, so I told the teacher that I wouldn't be doing the confirmation. The Royal Wedding and you know… stuff. It’s AfterElton’s Ladies’ Choice 2010!